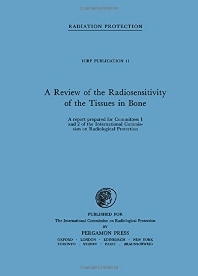 A Review of the Radiosensitivity of the Tissues in Bone is a report prepared by the Task Group for the International Commission on Radiological Protection Committees 1 and 2. The book reviews a biological indicator of the maximum permissible radiation dose. Data shows that an induction of malignant change should be considered as the limiting factor in maximum permissible levels for the bone. The risk of carcinogenesis in cells is connected with the proliferative potential of the cells. These cells are on bone marrow surfaces, in hematopoietic marrow, and in certain epithelial cells close to bone surfaces. The text also reviews the changes in the patterns of distribution resulting from growth and remodeling of bone. The book examines the effect of distribution of alkaline earth, of plutonium, of thorium, of americium, and of phosphorus in bone growth. The book also evaluates the comparative tumorigenic effects of external and internal irradiation of bone and the factors to be considered in determining the dose limitation from bone-seeking radionuclides. This book can prove beneficial to researchers and practitioners in the fields of radiology, internal medicine, or oncology. (v) Children Irradiated for "Enlarged Thymus"